← Pension Spiking, A Brilliant Strategy? Social Security is the largest social safety net program in America; for 2012 total expenditures were $786 Billion. When talking about Social Security most people refer to the retirement benefits, however there are two other important parts to Social Security, survivors benefits and disability benefits. Social Security stopped sending automatic statements in 2011, due to the cost of $70 million per year. It is imperative to know where you stand in regards to these potential benefits. You must sign up for online access to your statements. Social Security also offers an amazing downloadable tool to estimate Social Security benefits. Most Social Security benefits are determined by the worker’s earnings and the number of credits the worker has earned. Up to 4 credits can be earned in a year. In 2014 workers earn a credit for every $1,200 earned. Workers are considered “fully insured” based on their age and number of credits earned by that age. 40 credits is the maximum needed to be fully insured at any age. The highest 35 years of earnings are indexed for inflation, added together, and divided by 420 months to get the Average Indexed Monthly Earnings, or AIME. The AIME is then applied to the Social Security bend points of $816 and $4,917 to get the Primary Insurance Amount, or PIA. Everything under $816 has a 90% multiplier, between $816 and $4917 a 32% multiplier, and over $4917, a 15% multiplier. Once there is a PIA determined, then the amount of monthly Social Security benefits available depends when the worker chooses to take benefits. As you can see Social Security benefits are highly progressive. Looking at these numbers as yearly earnings, the first $9,792 earned results in a 90% benefit. from $9,793 to $59,004 get a 32% benefit, and earnings above $59,004 get a 15% benefit. Since many people aiming for early F/I have higher incomes for fewer years, in current dollars, a total of $342,720 in lifetime social security earnings would be needed to fill the 90% bracket; or $2,065,000 to fill the 32% bracket. Currently early retirement age is at 62, full retirement age is 67 and additional credits can be earned to age 70. Taking benefits at age 62 a worker will receive 70% of his PIA. The reduced amount is on a sliding scale and slowly increases to 100% at age 67. After age 67, workers earn a delayed credit of 8% of the PIA for every year delayed for 4 years total. Because of this it does not make sense to wait past age 70 to take retirement benefits. At age 70 a worker will receive the maximum of 132% of PIA. 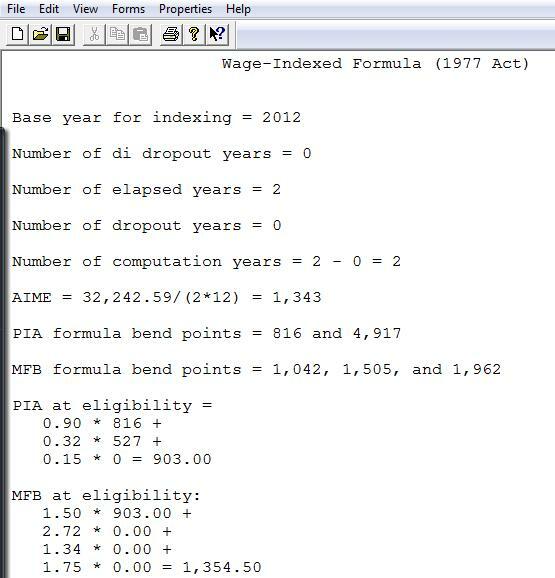 Had the individual been working during this time as well, higher earning years may have replaced lower earning years in the 35 years used to calculate the PIA, resulting in a larger payout. There are several strategies to “maximize benefits”, especially for married couples. One of the primary methods is the “file and suspend” method. In this scenario, the main earner files for benefits, and the spouse files for spousal benefits on his record. He then suspends his benefits and allows them to increase and takes them at full retirement age or later, his spouse then files her own claim after reaching full retirement age. Many people advocate a “take the money and run” strategy of claiming as soon as possible. The rationale for this is that they may not live until 79 when the “break even point” of delaying receiving benefits is met. Another reasoning for this strategy is a belief that the money may not be there later. On the other side of the fence is the argument to wait until Age 70, to maximize the monthly amount. These people see Social Security as “longevity insurance.” which is there in case they outlive their retirement savings. I am not advocating either path, as they are both going to be “user specific”. I myself lean more towards taking the delayed credits. I plan on having built enough wealth by that point in life that Social Security will be a relatively small portion of my world. If we can delay taking benefits until 70, I would rather use it as “longevity insurance”. My Social Security spreadsheet inside of the retirement spreadsheet is an excellent tool to project how much you will receive based on these factors. I do advise that people, especially “stay at home parents” look into their earnings records and strive to make sure that they will have a PIA that at least fills the 90% bracket. This will ensure at least something in retirement. To receive benefits based on an ex-spouse’s earnings record, the marriage would have had to been at least 10 years. I strongly recommend that everyone has their own earnings record. Many stay at home parents and teenagers work side jobs and do not report this money as income. This is a huge mistake. Besides being against the law, the money earned from selling crafts on ebay, babysitting, writing a blog, cutting hair, mowing lawns, etc… will count towards Social Security benefits. Claiming this income also allows teens and non-married stay at home parents to fund an IRA. For those who aren’t aware, my sister in law passed away in January. She was 21 and had two young children. She worked on and off here and there, but never made a lot. We figured that most likely her children would not receive any Social Security benefits based on her low earnings. Thankfully, we were wrong. The formula that Social Security uses for determining benefits takes age into account, so even though she didn’t have a long work history, she had enough to be “fully insured”, which by her age was 6 credits. Next they calculate the amount. Once again age is taken into effect. For her age group they take the 2 highest earning years, and calculate the benefit amount based on monthly average income, then enter that amount into their bend point formula. This ended up being around $750 a month. This isn’t a ton of money, but it makes a major difference in taking care of her children. Essentially everything under 29 years only requires 6 credits and takes into account the two highest years of earnings, then each year older, 1 more year of work is taken into account and 1 more credit is needed. 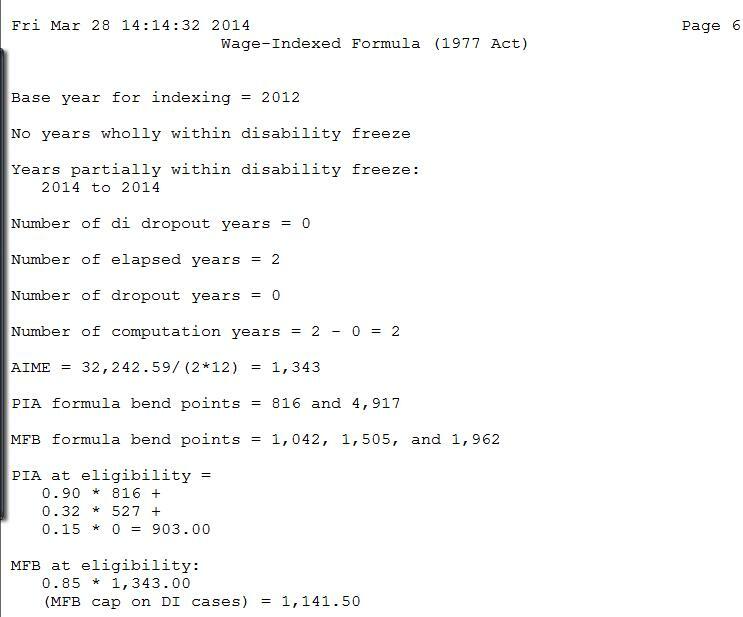 The following screenshots are from the social security estimator tool mentioned earlier. Let’s assume $15,392 (full time minimum wage) earnings in this scenario in 2010 and 2011 as the 2 highest years. When indexed for inflation these amounts combined are $32,242. This number needs to be divided by 24 to get the Average Indexed Monthly Earnings, or AIME: $1,343 in this scenario. To find out the amount for each individual survivor they then divide the MFB in half, giving us $677 in this scenario, and apply a multiplier to it of 75% for each individual. The total cannot exceed to MFB. 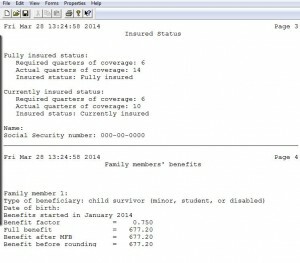 If there are two children who qualify for benefits, each would receive $677 X .75 = $507.75. First of all, buy term life insurance. I had talked to my sister in law about the importance of it when she became a mom, but we never took action. For people who have substantial life insurance, the need for the Social Security benefits is much less. Secondly, know what benefits you are entitled to by signing up for Social Security online. You can see your earnings record and a summary of what amount of benefits you are entitled to. Thirdly, and this is probably the most important one, do not dismiss this benefit! The years that determined her benefit amount were worked before she had children. She earned the benefits before there was anyone who would need to receive them. Since she became a mother she worked a lot less and her benefits if calculated on these years alone would have been much less. Having earnings at all makes a big difference here, we do not know what the future will hold. Had she slacked off in those years her children might have gotten nothing or a very small percentage of her current benefit. Likewise, had she earned full time minimum wage for those 2 years, her children would be receiving about $1000 a month instead. Although term life insurance is essential to proper planning, working even a couple years at minimum wage makes a huge difference in results for Social Security benefits. 53% of Social Security disability insurance claims are denied. Just like how survivor benefits are no replacement for life insurance, Social Security disability insurance is no replacement for actual long term disability insurance. While life insurance is still neglected by many who need it, disability insurance greatly lags behind, only 44% of workers have long term disability insurance. Disability insurance is just as important, if not more important than life insurance. With life insurance, you pass away, there are final expenses, but that is it. 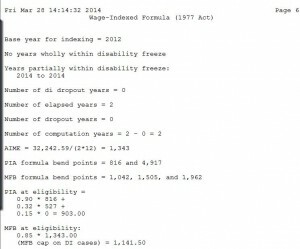 What if you become disabled and are then cash flow negative? This puts your family in a more difficult financial position, a 32 year old man is 6.5 times more likely to have a serious disability than to die! While Social Security disability insurance is more difficult to get than other Social Security benefits. (There is no “gray area” with being dead or being over age 62), People who are truly disabled will most likely receive benefits eventually. Social Security disability benefits are calculated in a very similar way to survivor benefits. The Age formula is the same, the AIME formula is the same, and the PIA formula is the same. Continuing with the previous example of a worker under 29 whose 2 highest years were full time minimum wage earnings of $15,392 in 2010 and 2011, we still have a PIA of $903. Now the MFB (maximum family benefit) is different. For disability it is a straight .85 for any amount of AIME. 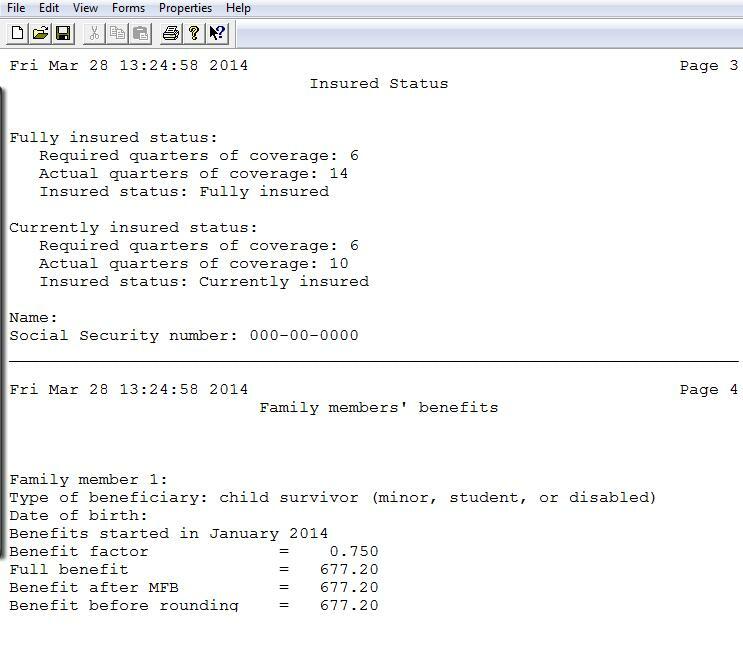 In this example the maximum family benefit is .85 X $1,343, which is $1,141.50. The worker would receive the PIA amount of $903. The worker’s children would be entitled to up to .5 X PIA, or $401.50. Since the MFB is $1,141.50, the total for the children’s benefits will be $238.50, or $119.20 each with 2 children involved. 1. Sign Up for Online Social Security Statements and download the estimator tool. 2. Buy Term Life insurance and Disability insurance. 3. Make sure the loved ones in your life who have dependents have term life insurance, If they run the numbers and can’t afford it, consider gifting it to them. Term life insurance is just as important for stay at home parents as it is for primary earners. 4. If you are a stay at home parent or plan to be: work enough through side gigs to bump up those Social Security zeroes, aim to at least fill the 90% PIA bracket by earning $816 a month. 5. Encourage (and if you can, require) the teenagers and young adults in your life to work. It teaches them life skills, gives them an employment history, allows them to contribute to a Roth IRA, and it buys Social Security Insurance. 6. Let your loved ones know where you are on Social Security Benefits. Work on improving your eligibility by using their estimator tool. 6. Download my retirement spreadsheet and use the social security sheet in conjunction with the Social Security Estimator to plan your retirement benefits. 7. Read my post “The HSA Payroll Deduction, Bad Idea?” to see the potential harm that contributing to an HSA through paycheck deductions may cause to your Social Security Benefits. What are your thoughts on the social security system or on various aspects of how benefits are calculated?